What did we all do for coffee in central London before Kaffeine? The streets were few and far between, so pilgrimages to coffee hot spots around East London were the norm, along with a little shop in Soho of course (which was the inspiration behind opening Kaffeine). Looking around at the coffee scene in the UK now, it is clearly evident that Kaffeine has been the inspiration for so many others. When Kaffeine first opened in 2009, I sent my wife to scope it out. At the time she worked on Great Titchfield St, and I had heard murmurs of a new coffee shop which was serving Square Mile coffee. The reports came back exactly how I was hoping – this would become my wife’s new lunch spot, and I had even more of a reason to visit her than before! Within seconds of walking through the door, you are greeted by one of the attentive floor staff who will take your coffee order and help you decide if you need to have something with your coffee (you most definitely do). Behind the glass display are an amazing choice of tasty homemade provisions, something which has been a big focal point since Kaffeine’s inception. All of the food is lovingly prepared downstairs, with a heavy focus on fresh and seasonal ingredients and even including foraged fruits and herbs. If you don’t already subscribe to the Kaffeine blog, you have been missing out on delicious weekly menu updates along with the honest yet witty musings of cafe life. Peter Dore-Smith isn’t your normal coffee guy, far from it in fact. He started in hospitality as so many young people do, washing dishes and cleaning ashtrays at local restaurants and pubs in Melbourne, and eventually worked his way up to pouring pints, waiting tables, and managing staff. 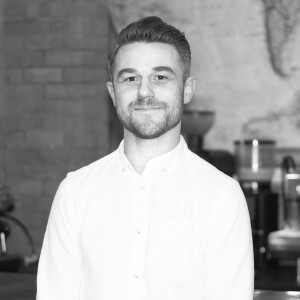 After moving to the UK in 2005 and working for a recruitment agency for the hospitality industry, Peter and his wife decided it was time to open their own speciality cafe. They started what would end up being almost 2 years of R&D which finally lead them to Great Titchfield St in Fitzrovia. From the very beginning, customer service and satisfaction have always been at the top of the agenda. Originally opening with a 2 group Synesso Cyncra and Anfim Super Caimano grinder, Peter was frustrated that customer wait times were creeping up, so after a quick refurbishment in went a 3 group Cyncra and Mazzer Robur-E which sped up speed of service, and kept wait times down to a maximum of 4 minutes from time of ordering to drinking. Speciality cafes are not generally known for their speed of service, so focusing on this has given Kaffeine another tick in the right box. Something which I have always enjoyed is the palate cleanser you receive with an espresso – a 3oz glass of sparkling cascara and earl grey tea. Another great way to experience this is by sampling their tasting board: a single shot of espresso, 5oz flat white and a shot of sparkling cascara (I find it is best to wash this down with a home made Portuguese tart). After years of being continually asked when he would open another shop, Peter finally took the plunge and in March 2015 Kaffeine on Eastcastle St was born. While only being a 5 minute walk away from the original site on Gt Titchfield St, he believed being close would not be detrimental to business. The sheer number of people who couldn’t be served at the original site due to space now have somewhere else to go to, along with a new set of customers unaware the original even existed. The fact that Eastcastle St is now as busy as Gt Titchfield St means the gamble has paid off. The saying ‘if it aint broke don’t fix it’ definitely applies here. The look and feel, although updated from the original, has the same warmth, feel and flow, necessary to facilitate almost 700 customers per day. Design props have to go to William Tozer Architects for their work on Gt Titchfield St, Design LSM for Eastcastle St, and of course not forgetting Peter and his wife Rita (who had a strong influence on the recent refurb). Exposed brick walls, wooden floorboards, low pendant lighting, glass display cases – this was a trend not seen in a lot of cafes before and it has definitely paved the way for many others following. Pastries and bread are suppled by Seven Seed Bakery, as they have been for almost 7 years, while everything else is prepared on site in the kitchen downstairs by the talented chefs. Rather than a multitude of coffees and methods available for brewing, you have some of the most consistently prepared espresso in the UK, with Red Brick and decaf being given the love that they deserve. Machinery has been given a slight update, with a Victoria Arduino Black Eagle Gravimetric and Mythos One helping keep standards and consistency up. The baristas are as meticulous as ever, carefully crafting each drink while always smiling and holding conversations with customers. After almost 7 years, two amazing cafes and countless awards including Best Independent Cafe in Europe and the UK, Peter continues to pave the way for speciality coffee. We feel very privileged to have worked with Kaffeine since the beginning, and we would like to thank them for their continued support.